Newly Expanded 45 foot by 25 foot Production Studio! Need A Video Production or Film Studio? Need Film Equipment and Lighting? 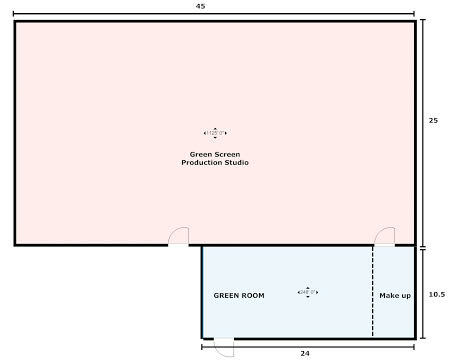 Rent Only the Production Studio or Hire Our Entire Film Crew with Gear! We understand that every production is unique. $175 Per Hour Rate applies to weekend studio rentals 9am to 6pm. And service comes first with a Friendly and Professional staff to make sure your project runs smoothly. RCS can provide everything from a full production crew with grip lights and equipment to an empty green screen room. Our Studio is large enough to fit small sets and stages, to a complete production ready stage with lights, an HD camera and production crew (makeup, sound, directors, assistants, camera operators etc). Studio B is equipped with a lighting rig which increases the space you have to fit your production. Our studios are equipped with super fast broadband internet peaking at 45bps download and 2mbps upload. We also offer hard lined state of the art iMacs along with encrypted wifi for the crew at no extra charge. All production rentals also come with light craft services, a stage manager and half hour of free technical support, as a complimentary service to all our clients. Reel Creative Studios is a full service video production company based in New York City.